Congratulations to the recipients of the 2014 Innovation of the Year Award! 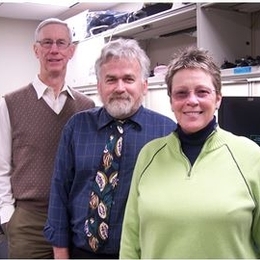 The 2014 Innovation of the Year Award has been awarded to Barbara Tollinger, Professor/Chair, BIS; Robert Sherman, Associate Professor/Chair, CIS and Ken Hook, Assistant Professor, CIS for their project: SCOPE Help Desk. Through collaborative efforts between the Business Information Systems and Computer Information Systems departments emerged the innovative project, "SCOPE" (Students Correcting Open-door PC Emergencies). In its third year of full operation, SCOPE serves a dual purpose: (1) helping Sinclair students, staff, and faculty with computer technology support needs not met by any available service on campus; and, (2) providing authentic, hands-on work experience for CIS and BIS students. The quality of student education has been improved through the real world hands-on work of the students during their service in the SCOPE help desk. Rather than just hearing about a technology in a lecture and experiencing a few examples in a homework assignment, SCOPE students perform daily troubleshooting and other IT services. They learn real-time, industry-relevant problem solving skills in a host of areas. Students perform data backups; conduct diagnostic testing; install hard drives, hardware, software and memory; reimage computers; run setup routines; secure and tune up systems; and complete wireless networking installations. Between fall of 2011 and January 2014, SCOPE has delivered more than 4300 different support services for free, with a documented cost savings of over $500,000 dollars to students, staff, and faculty! SCOPE is currently located in Building 13-223. As a board member college of the League for Innovation, Sinclair Community College has participated in the League's Innovation of the Year Award for the last 25 years! We should all be very proud of the outstanding innovations the College has recognized since 1989. An Innovation of the Year project or program reflects capstone achievements and the continuing renewal of the spirit of innovation and experimentation upon which the League was founded.